'Light Up 2018' has been the spectacle that took place on the eve of the new year, in the skyscraper Burj Khalifa. An event that encompassed an area of 109.252 square metres and wowed an audience of more than 2,500 million people through live transmission by television and social networking. The United Arab Emirates have once again surprise the world with the show that was organized in the Centre of Dubai to welcome the new year. 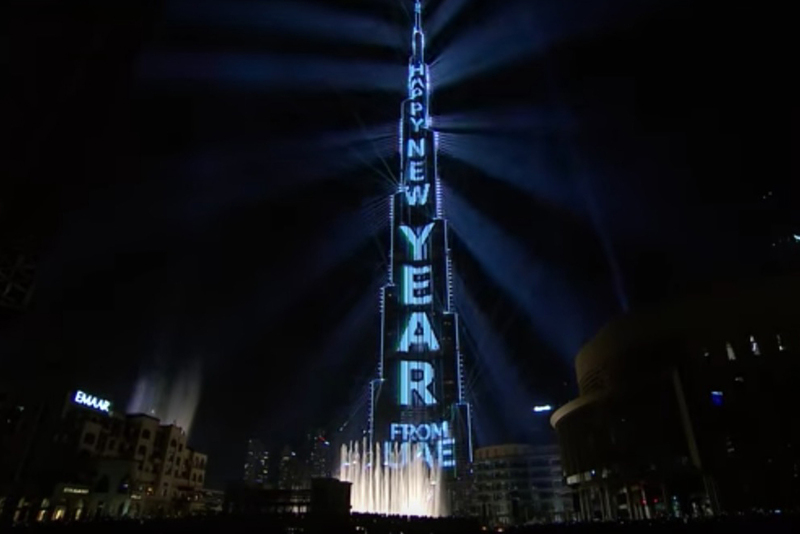 In the Burj Khalifathe tallest skyscraper in the world, offered the 'Light Up 2018' show, which hosted more than one million visitors from around the world and had an audience of more than 2,500 million people through the transmission live on television and social networks. This show, organized by the real estate company Emaar Properties It has also secured a place Guinness World Records (the Guinness Book of records) as the 'greatest show of lights and sounds in a same building', covering an area of 109.252 square meters, more than double the previous record.
' 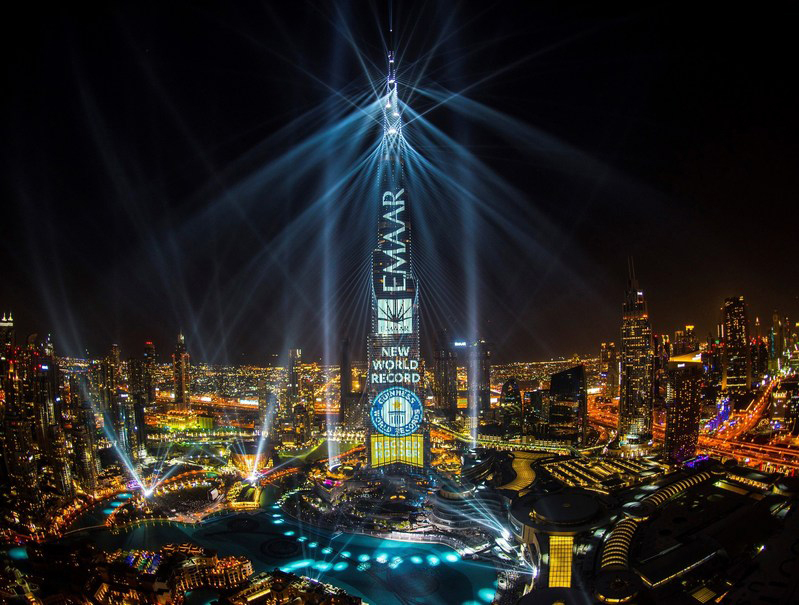 The show '2018 bring to light' is a tribute to the nation, which celebrates their achievements and put the UAE on the world map as the place in which converge and connect the inspiring minds ", said Mohamed Alabbar, Chairman of Emaar Properties. 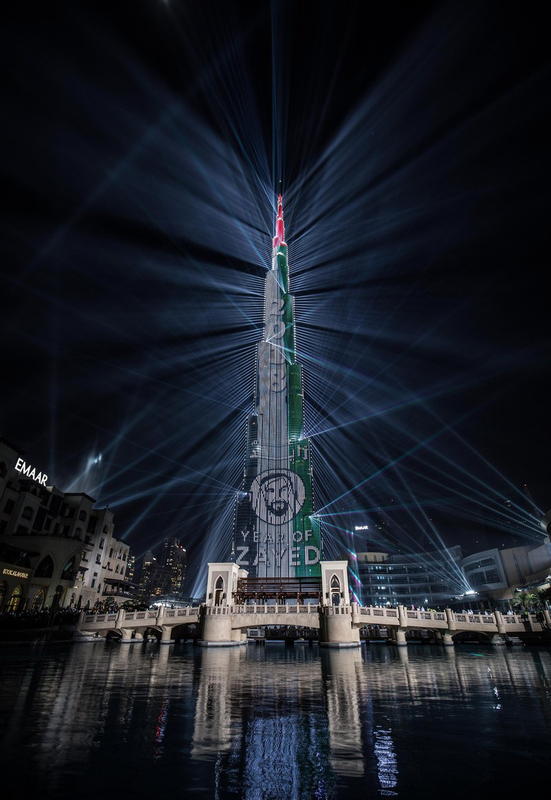 With the 'Light Up 2018' show will have extolled the achievements of the United Arab Emirates and paid tribute to the founder of the nation, Sheikh Zayed bin Sultan Al Nahyan, on the occasion of the 'year of Zayed' in 2018. The show also included the flight of a Hawk and the representation of the next icon of Emaar, Dubai Creek Tower, in the port of Dubai Creek. This event has involved the installation of lights, UV and accessories with a total weight of more than 118,44 tons and 28.7 km of cables. The show transformed the Centre of Dubai into one of the brightest spots in the world with a luminosity of 76.3 million lumens. Mounted carefully choreographed laser beams (certified as 100% 100 safe for the human eye) and Led light bulbs power / efficient using 25.3 km of ropes with the support of a special team of 20 ton steel Assembly. 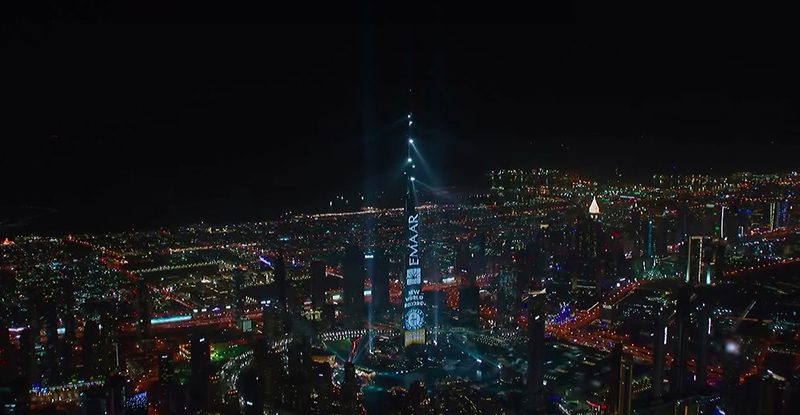 More than 40 special lasers from outside, 230 high-voltage xenon projectors were installed and 280 beams of light in motion, from outside, all underlined by the installation of projectors and laser located at 828 meters, the height of the Burj Khalifa. More than 300 professionals worked in the place, even a hundred experts cordistas. Powerful laser beams and new 1.1 million pixels of the Burj Khalifa Led panel came into life with inspirational themes and drawings in a myriad of colors. The laser, lights and fountains show was a tribute to the UAE and Dubai and included abstract descriptions of the forces of nature. The entire show has been choreographed with music performed by the company Dhabiwood Studios. Over 80 musicians from the United Arab Emirates have joined for the musical composition that has been recorded in studies of Dubai and Cairo. This is not the first time that a new year's Eve show organized in the skyscraper Burj Kalifa of Dubai entering the Guinness book. As already published in Digital AV Magazinethe event celebrated the new year of 2015 earned him entry into the Guinness World Record. This time was for the "greater facade illuminated led in the world" which covered a surface of 32.467 square meters, beating the existing record up to that time was held by the Mall Taman Anggrek in Indonesia.